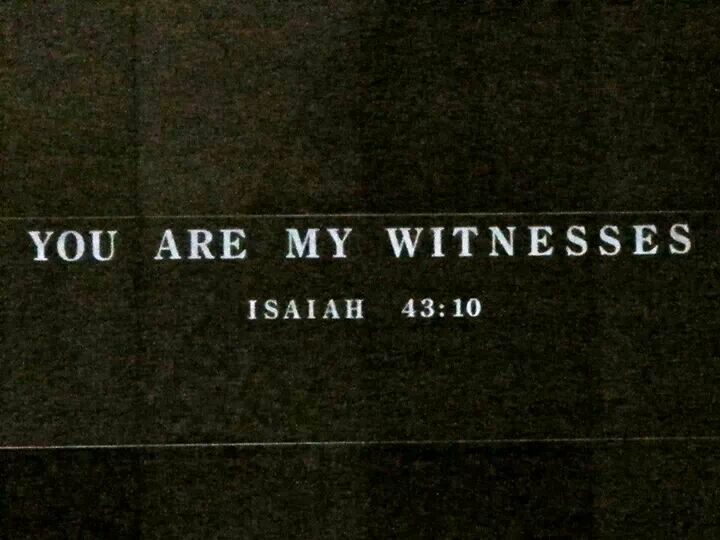 Upon entering the Holocaust Memorial Museum in Washington DC, visitors pass a stark black marble wall with the single engraved phrase "You Are My Witnesses" from Isaiah 43:10. 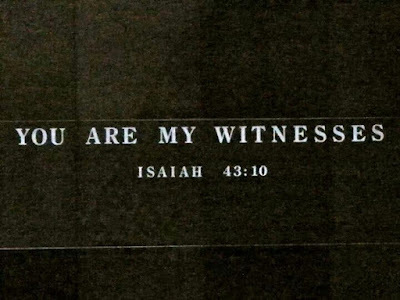 It is a stunning architectural reminder of the holocaust mantra "Never Again." Death imprint. Extreme anxiety about death. Recurring mental images of violence and death. Death guilt. Uncertainty. Aimlessness. Wondering why one survived when others did not. Psychic numbing. Insensitivity or diminished ability to feel. Suspicion and distrust. Foreboding sense that everything, even life itself, is an illusion. Witness imperative. A sense of mission to bear witness to future generations. The deep and abiding impulse to testify of one's experience helps a holocaust survivor create some personal sense of a moral and rational universe. See Dori Laub and Andreas Hamburger, editors, Psychoanalysis and Holocaust Testimony: Unwanted Memories of Social Trauma (London and New York: Routledge, 2017) and Sandra Williams, "The Impact of the Holocaust on Survivors and Their Children," written while she was a student of Judaic Studies at the University of Central Florida. The Nephites experienced a holocaust and many evidences of "Holocaust Survivor Syndrome" show through in Mormon's and Moroni's words. Death imprint. Mormon 4:11 "... the horrible scene of the blood and carnage which was among the people ..." Mormon 5:8 "... such an awful scene of blood and carnage as was laid before mine eyes ..." and Mormon 6:7 "... that awful fear of death ..."
Death guilt. Mormon 8:3-5 "... whether they will slay me I know not." "... whither I go it mattereth not." "... I have not friends nor whither to go; and how long the Lord will suffer that I may live I know not." Psychic numbing. Mormon 3:12 "... the hardness of their hearts" Moroni 9:5 "they have lost their love, one towards another ..." and Moroni 9:20 "... they are without principle, and past feeling ..."
Suspicion and distrust. Mormon 1:18,19 "the inhabitants thereof began to hide up their treasures in the earth; and they became slippery... " "... sorceries, and witchcrafts, and magics ..." and Mormon 2:10 "... no man could keep that which was his own ..."
Witness imperative. Mormon 3:16 "... I did stand as an idle witness to manifest unto the world the things which I saw and heard ..." and Moroni 9:22 "... to witness the return of his people unto him, or their utter destruction ..."
The Book of Mormon can be profitably read from dozens of perspectives. In this case, trauma psychology helps us better understand its authors and their powerful messages.